I met Maxine at the craft show on Sunday at the Summer Crafting Show in Doncaster. 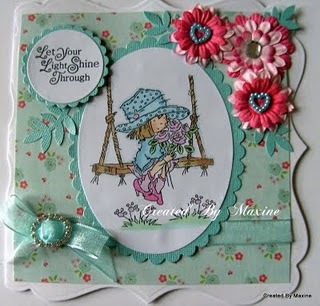 Maxine has already made a card using some of our goodies, love this card which she made using a LOTV stamp……..It is soooo cute! ‘ This is one of the new lotv stamps I got yesterday from the Doncaster show. I’ve also used ribbon, diamante ribbon buckle, self adhesive gems and pearl beaded hearts all from MeiFlower crafts, please go and check out Mei’s lovely embellishments and ribbons, there’s a link on my sidebar to Mei’s lovely shop’. The paper is from the lovely Tea house pack from Dovecraft. 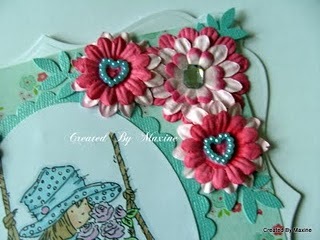 I love the way Maxine has used the pearl hearts on top of the silk flower petals, a lovely setting for them. 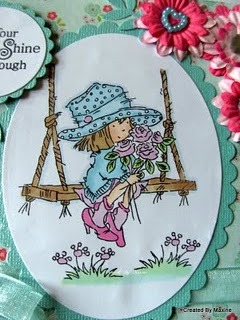 Gorgeous card Maxine, love it . . . . . Love it! This entry was posted on Tuesday, July 19th, 2011 at 7:42 pm	and is filed under Birthday Cards, Design Team. You can follow any responses to this entry through the RSS 2.0 feed. You can leave a response, or trackback from your own site. Gorgeous card love the way you’ve used the pearl hearts to decorate the centre of the flowers not something i would have thought of.